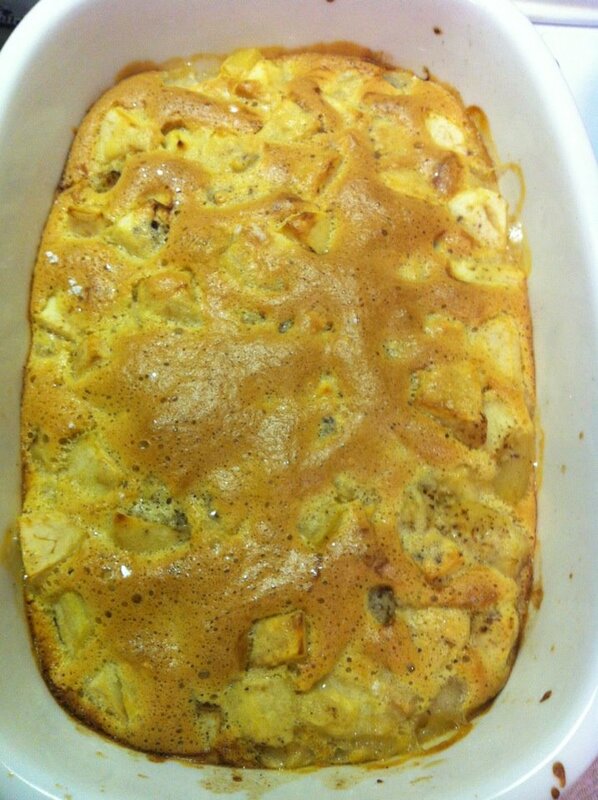 and this is what I cooked: Apple and Pear Pudding or "Fruity toad in the hole"
Apple and Pear Pudding or "Fruity toad in the hole"
This evening I invited a few friends (who, like me, do not have their Mums in the same city as us to celebrate Mothers' Day) around for Sunday dinner. Did my standard lamb roast with honey & mustard (if I haven't blogged this recipe I will soon) which is often the orphan's Sunday dinner of choice at my place. Whilst I was waiting for everyone to arrive, I noticed my fruit bowl had a couple of huge red delicious apples and beurre bosc pears rattling around from last week's grocery shop and I decided dessert could be fun. After a quick squizzer on taste.com.au, searching apple+pudding, I found a lovely "Apple Sponge Pudding" recipe as a starting point. Basically I followed the recipe except I used two large red delicious apples and two large beurre bosc pears in lieu of the 6 apples the recipe calls for. I also could not for the life of me find my jar of "mixed spice", so I added cloves to the fruit stew mixture and cinnamon to the pudding batter. I had also run out of icing sugar (I have been interstate for 3 of the last 5 weeks) - brown sugar sprinkled on top was just fine. There was some chocolate icecream in the freezer but no vanilla, which was a tad weird but still delicious. Will definitely try this recipe again, possibly with more fruit, and a different baking dish. Plus icing sugar and vanilla icecream. For a quick and easy pudding it was pretty good!